The ocean and beach is one of my favorite places to go and to paint. The light on a clear summer day with the big expansive views allow a painter so many subjects to choose from, not to mention all the figures. The figures bathed in light and often at rest are perfect models. 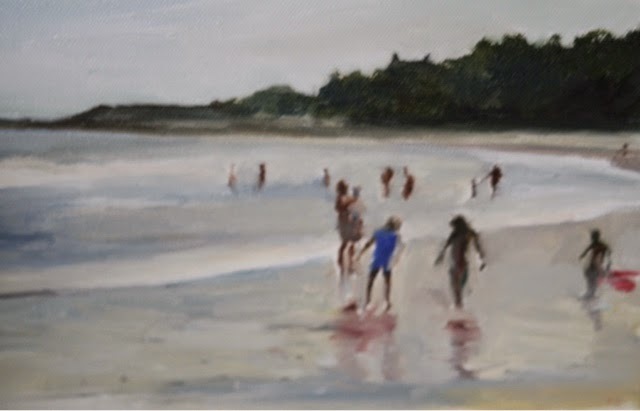 I also love drawing and painting my own family at the beach. These have been really rewarding as many include my wife and children as models. The beach is a great place to draw as you don't really stick out as you are drawing. The views from sitting down in a chair can be interesting rather than standing. Also, all the figures over a great distance are fascinating to me as they appear in different sizes as the perspective moves back into the horizon. 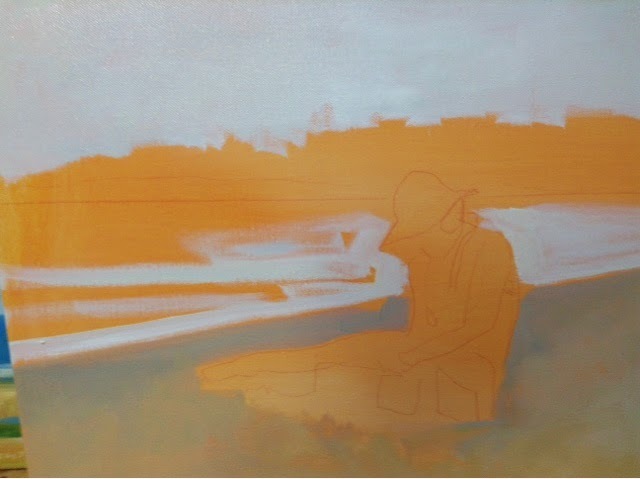 I started the below painting by covering canvas in a warm color. Vermillion thinned down works nicely. Below is the almost finished painting where you can see I added my son to the composition as I wanted another figure in the foreground. 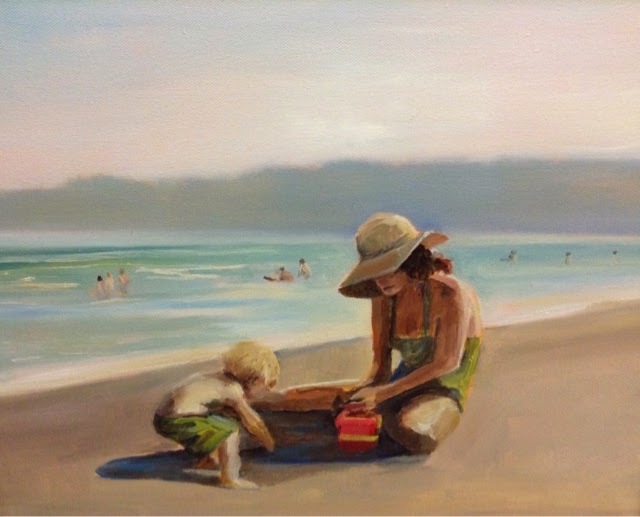 Painting at the beach also allows me to place objects like chairs and umbrellas in the painting from drawings to balance the painting with color and form that works for the composition of the painting. I really enjoyed seeing some of the photographs of people at the beach by Vivian Maier recently. 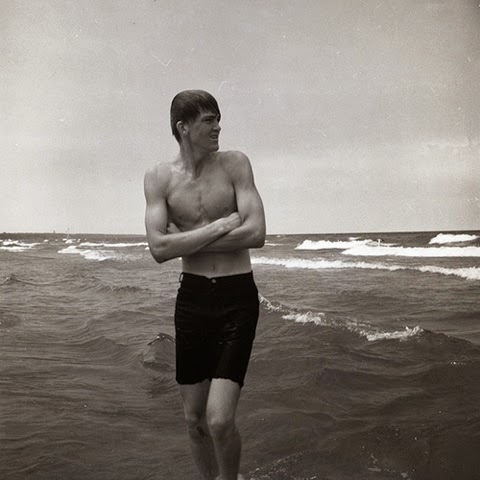 The figure against the ocean as a back drop creates a great tension. The flexing of mussels against the movement of the ocean is beautiful. 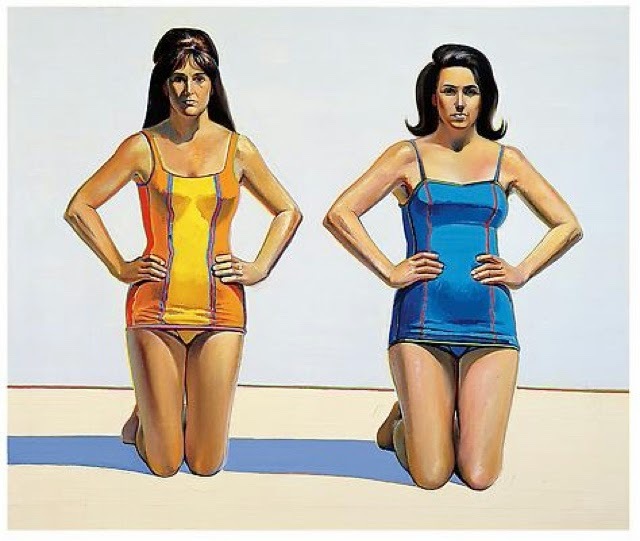 Another artist who I admire and enjoy their figure paintings is Wayne Thiebaud. 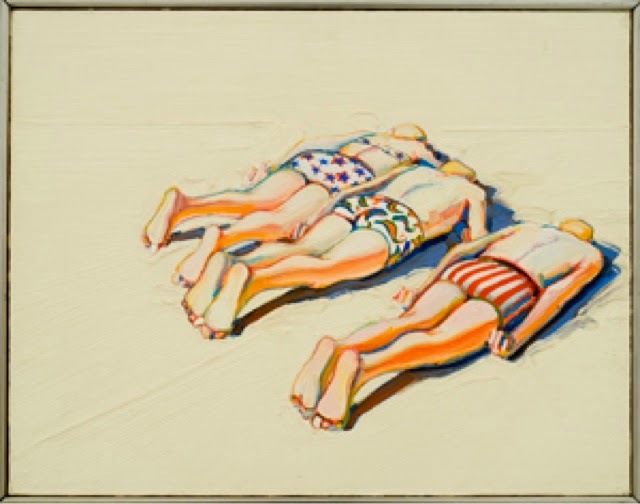 playfulness of Wayne Thiebauds' beach figures capture some of that fun and color that I associate with the beach. Wayne is 94 years old born in 1920! 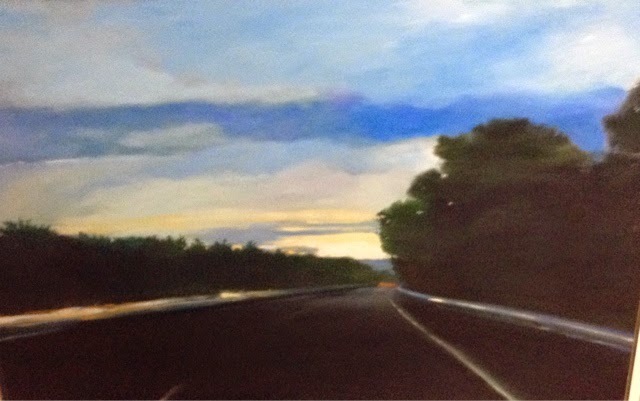 Here is finished work 24 x 36 inches, oil on canvas. 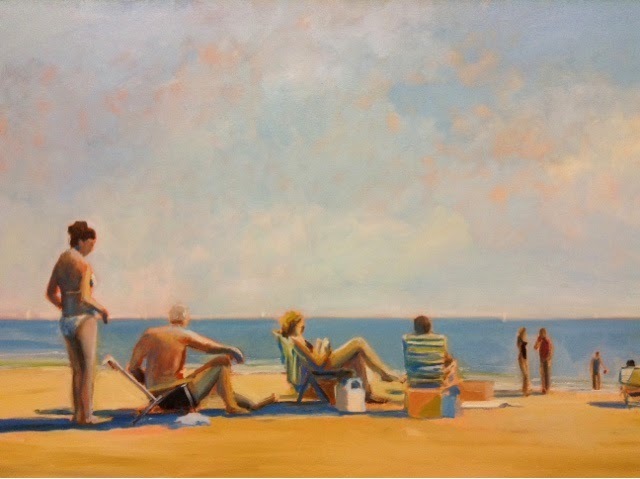 On view at Cavalier Gallery on Nantucket Island. I really love painting a group of people gathered together. There are few reasons that a group of people get half undressed and pose for free for a painter other than to sit by the ocean. 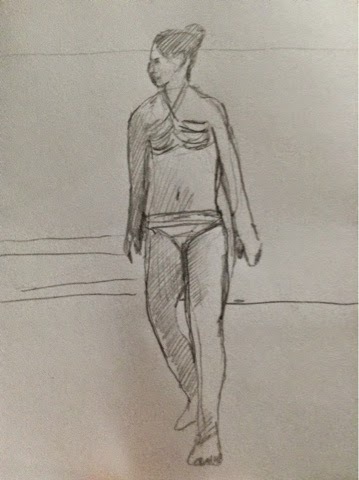 Currently I have been taking drawings from the past summer with figures at the beach. 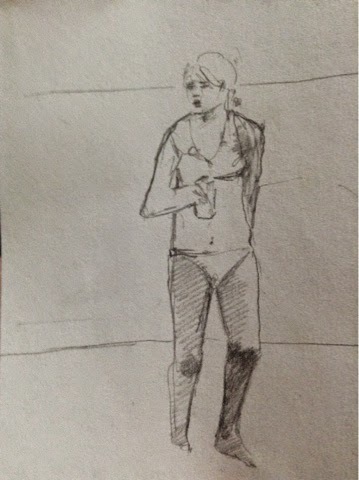 In drawing I can work out the composition and add details from life. I have always enjoyed drawing. Drawing is the foundation of painting. Making many lines, marks and smudges to make one big picture. Whether you use a paintbrush or a pencil drawing is crucial. Like in music each note adds to the piece and it builds slowly to create form and volume. I like going over and over again changing and correcting trying to make the space real and pleasing. Drawing takes time. It sits you down and you are forced to look at things and study them. In a way it is a form of meditation. Some times it takes a lot of energy to look at things. Really study them. We don't want to slow down enough to do the looking. Drawing helps me slow down and really be amazed at what is around me. Reality is so strange and wonderful yet easy to take for granted. As I look at people moving in space and try to discribe that space and those bodies in it I become more a part of what is around me. More connected to what I am looking at. Most of the time the scene is very complicated and I am forced to simplify. 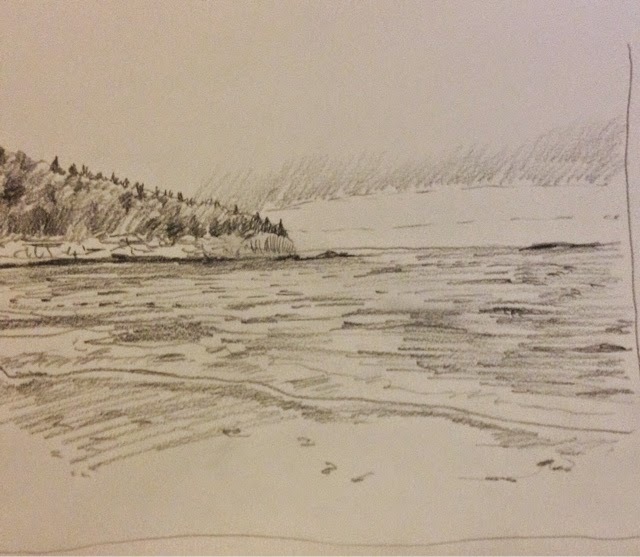 Below is a small study of a girl at a beach and then an empty beach in Maine. I often debate with myself what surface I prefere to paint on. Sometimes it is nice to switch things up. If I have been working on panel it can be nice to move over to canvas. The give that canvas has can be nice in the early stages when mapping the image out. The play and bounce of the canvas becomes its own language. The force that the brush playes back is a conversation that feels different than panel. It is also nice to hit a new canvas and hear the drum sound. When painting with turniptine the canvas absorbs the terps better than the panel would. The hard panel has a directness were each mark is free from the texture of the canvas or linen and is easier to read and give the illusion of space in an emediate way that canvas doesn't do. Sometimes when getting up close to a canvas the materials stop the mind from the trick of photographic illusion. With the painting above I used a palette knife in the clouds in the sky. 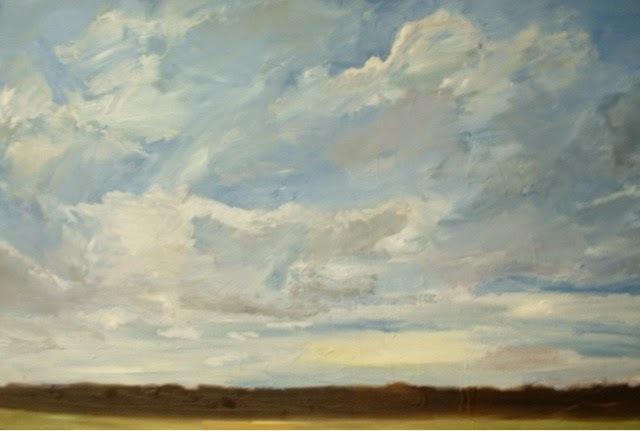 I really enjoy painting the sky and like John Constable will make studies for larger works. 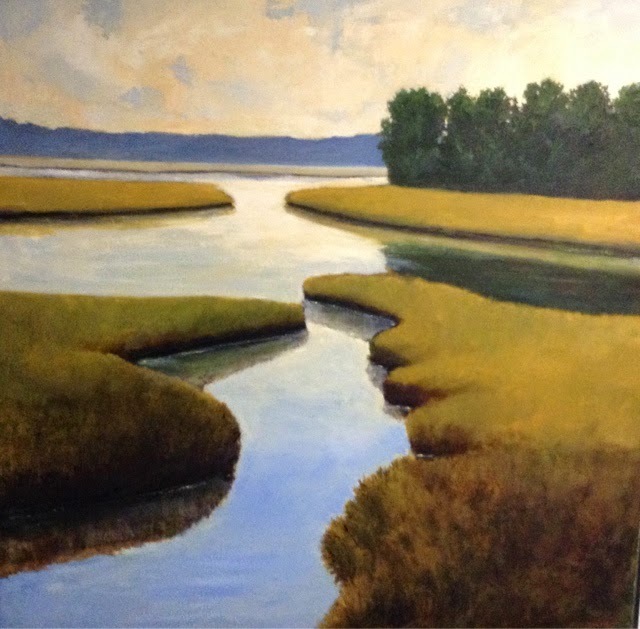 This painting is painted with more layers using liquin as a glaze. With panel I find that I tend to paint with a little less impasto. It I do use impasto it is with the whites and I employ less paint with the darks such as brown and green. Usually the panels are first painted with an orange or thin red oxide. This way the white really jumps out and the values can be established. 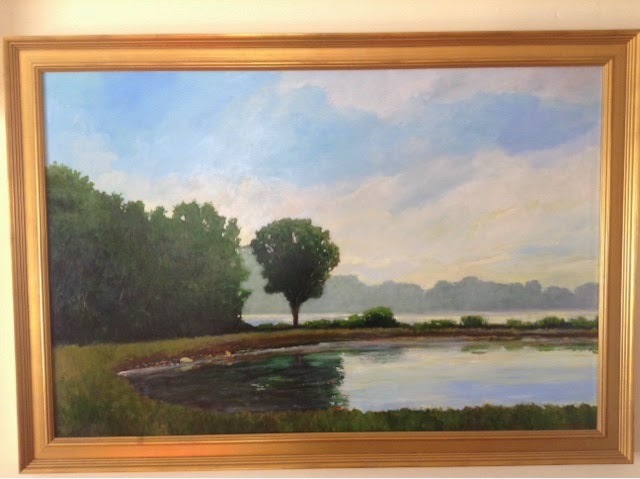 To me in landscape painting the values are the first thing as with drawing. The color comes next never before the value. After this the sky was keyed in. All the other values are compared with the sky. 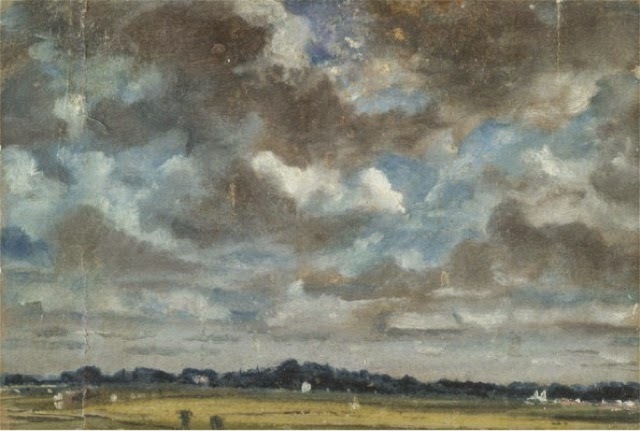 Below are some skies painted by John Constable. 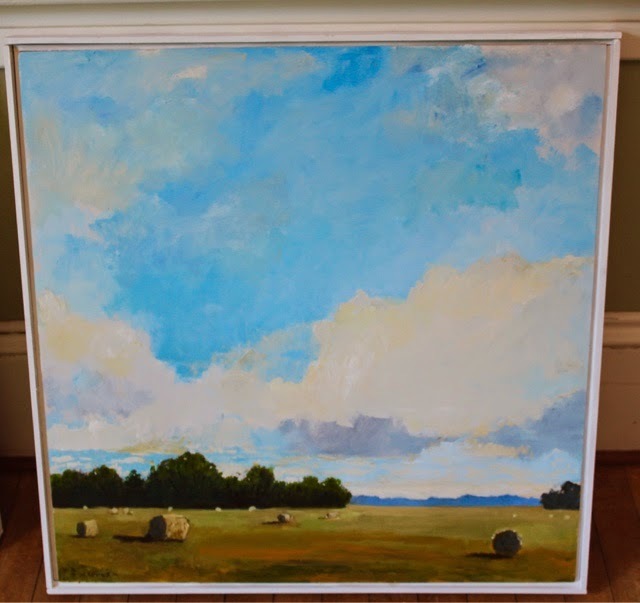 I often also make sky studies for reference using them in later paintings. 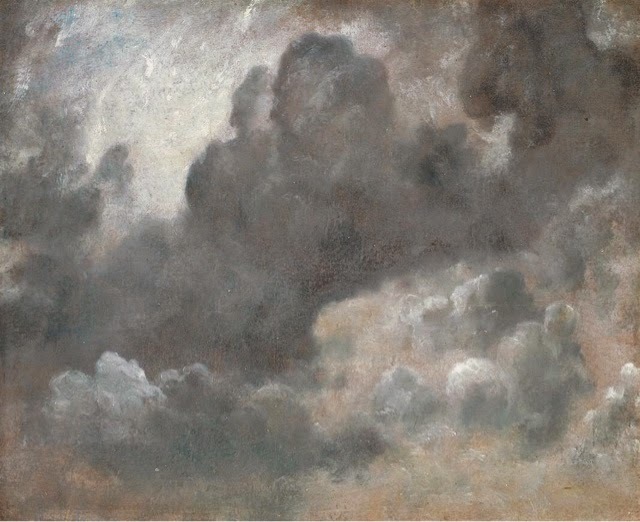 Below are a few paintings on panel that the skies were borrowed from smaller sketches of the sky that were done plien air. The sky above looks from the image as if there is too much cerulean blue. In truth there is more ultramarine but the photograph doesn't reflect this. 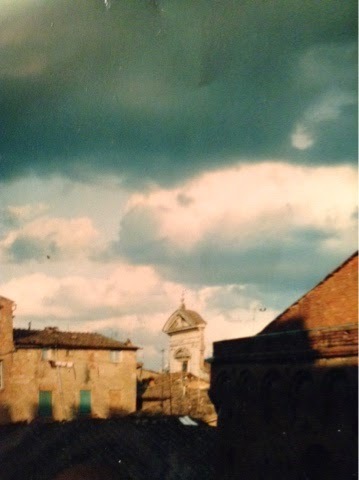 My studies of sky's first began in Orvieto, Italy; a medieval hilltop village in Umbria. Below is s photograph I took there of the sky moving above the ochre tufa of the buildings.